Volume 1. By Stuart Bull. Road Rock Lick Library. Technique, Blues, Instruction. DVD Only. Lick Library #MUSRDR0075. Published by Lick Library (HL.393035). 5.25x7.5 inches. With Stuart Bull. 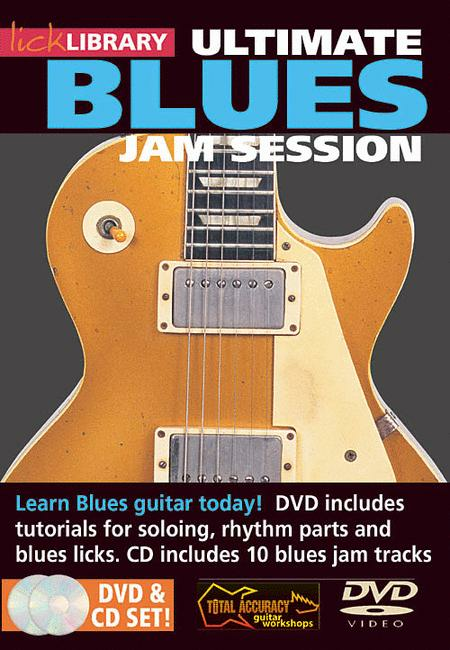 The ultimate DVD for the aspiring blues guitar player, with full tutorial lessons and a generous selection of backing tracks to jam to. This DVD is complete with an audio CD that contains 10 professionally-produced jam sessions, minus the lead guitar. All you have to do is follow the detailed lessons on the DVD and you'll learn everything you need to jam a great blues solo. You will learn scales, chords, rhythm ideas and countless string-burning licks, giving you all the confidence to jam with a full band.The ultimate DVD for the aspiring blues guitar player, with full tutorial lessons and a generous selection of backing tracks to jam to. This DVD is complete with an audio CD that contains 10 professionally-produced jam sessions, minus the lead guitar. All you have to do is follow the detailed lessons on the DVD and you'll learn everything you need to jam a great blues solo. You will learn scales, chords, rhythm ideas and countless string-burning licks, giving you all the confidence to jam with a full band.